Double Decker is such a simple fundraising idea. You wont get a more simple fundraising idea than Double Decker. You might be surprised however what a great little money-maker it can be at your fete! All you need are two sets of playing cards. One set is laid out face upwards and stuck to a table or board. You don't actually have to use the whole pack but you need both packs to have corresponding cards; that way you you can offer a prize every time. Small prizes are then placed on each card. The majority of these can be real boobies - sweets, ballons, 1 penny pieces etc. One or two of them should have more substantial prizes on - cash, chocolate bars, toiletries etc. You may wish to also have a really special star prize perhaps on one of the aces. In the example here you can see an Easter Egg on the ace in the middle. In fact although we call this fete stall Double Decker you could also call it Find the Ace and have good prizes only on the aces. Of course you could choose any other number or picture card. 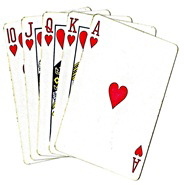 The stallholder then shuffles and offers the other pack of cards to competitors who choose a card blind by simply cutting the deck.They win whatever is on the card that matches the one they chose. The fun is in having all the cards laid out and the majority winning a silly little trifle or sweet. This is one of those stalls where having the right person manning it can make a lot of difference. At fairgrounds these people are called the "barkers"
You need a cheeky type who can really "big up" something simple and make it fun. Praise the winners for their skill in choosing the lucky cards! Tease the less successful and goad them into having another try etc. Ok its a very simple fundraiser. But its perfect for the village fete or school fair. Give it a go - you will be very glad you did! Higher - Lower is pretty much the most simple game you can do at a fete or fair. This makes it an ideal game for kids to run themselves. All you need are a pack of cards and some prizes. Up to 10 cards are placed face down on a table (or on a fancy stand if you want to go all Gameshow!). 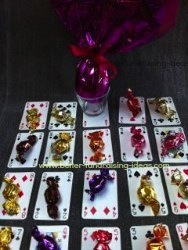 You can get hold of extra large playing cards online but only if you want to make a bit of a show. A customer pays a fee to take part and the first card is turned over. He / she then has to say if they think the next card will be higher or lower. The second card is then turned over to see if they were correct. If they got it right they have to guess whether the third card will be higher or lower than the second. When they get it wrong that is the end of their go. If they get to the end of all the cards they win a prize.